Does Halloween candy call your name, even in April? Are you powerless against the sweet stuff? 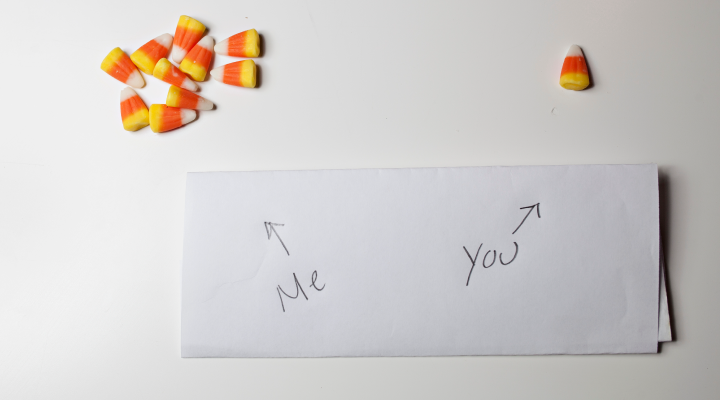 It may not be your fault; you may have the candy corn gene! It was established in the 1970s that humans have specific genes that cause us to crave sweets. But, scientists couldn’t locate the genes back then. In the early 2000s, this changed when researchers discovered that a sweet tooth is genetic and comes from the “sweet-tooth genes” TAS1R2 and TAS1R3! Around here, we like to call these the candy corn genes. The way we perceive taste differs from human to human. This is because of our genes makeup the alleles, or traits, in the sweet tooth genes. They determine just how much you’re going to like sweetness. A preference for sweetness versus a preference for bitterness comes from how these genes are composed. In the right combination, you’ll inherit a spiked preference for heaping amounts of sweets and fatty foods! When this spiked preference is rewarded, positive chemicals are released in the brain. This causes a person to feel a rush of joy. Since the discovery that a sweet tooth is genetic, those with sweet tooth genes were thought to be cursed with the cravings of sugar-fuel maniac! What we know about the candy corn gene doesn’t stop there! Discoveries about this curious gene continue to mount. In 2018, a fascinating finding turned what we thought about sugar consumption on its head. The “sweet-tooth genes” TAS1R2 and TAS1R3 are also linked to lower body fat! “It contradicts common intuition that people who eat more sugar should have less body fat. But it is important to remember that we are only studying this specific genetic variation and trying to find connections to the rest of the body,” says Associate Professor Niels Grarup, Novo Nordisk Foundation Center for Basic Metabolic Research. This is just a small piece of the puzzle describing the connection between diet and sugar intake and the risk of obesity and diabetes,” Grarup continues. Another scientist suggests that people with the sweet tooth gene have a lower consumption of protein and fat in the diet, giving them lower body fat. Though headlines may be reading, “Candy Now Leads to Slimmer Waste Line!” it’s not so simple. Higher blood pressure and an apple-shaped figure are also present with the gene. Aren’t you glad you didn’t gorge yourself on candy corn while you thought it lowered body fat? We still have so much to learn about the human body. For now, enjoy that Halloween candy, brush your teeth after, and keep your eyes peeled for more discoveries about the ever-evolving candy corn gene!